A couple of days back I was preparing my all time favourite snack Maggi and wanted to share with the Maggi group. Yes, we have formed a Maggi Group, no kidding. But the problem was that, the last time someone among the group shared a tweet including all the group tweeters was some 10-15 days earlier. So, I had difficulty in finding the group tweeters as I had updated my timeline with almost 800-1000 tweets after that. The alternative was to search my own mentions. But searching the mentions section was also a tough job as there were plenty of awesome tweeples who had mentioned me after that. So I decided to search my own tweets with Twitter’s Advanced search. I tried different functions but the search result only displayed recent tweets. But as I said, the previous tweet containing Maggi as the hashtag was tweeted by some group tweeters a couple of weeks back. So, I had to Google for the solution. And as expected Google gave me the solution right away. That’s the reason why I’m sharing some of these methods to perform a quick search within your own tweets or timeline. There are more than 10 ways to search within your own old tweets but I’m mentioning only the Top 3 methods in this post. Yes, you can also Advance Search using Social Media Apps, but I’m mentioning only those methods which give our search result quickly. Hope it will solve some tweeters problem. I came across many tutorials when I searched for the solution to my problem. Almost every tutorial had some 5-10 list of methods to search within our own tweets. But unfortunately non of them gave me the solution to my problem. So I again searched with a different term and this time I looked for site’s which are specifically built with the purpose of searching Twitter. SnapBird appeared as the second result and I went there and entered my query. 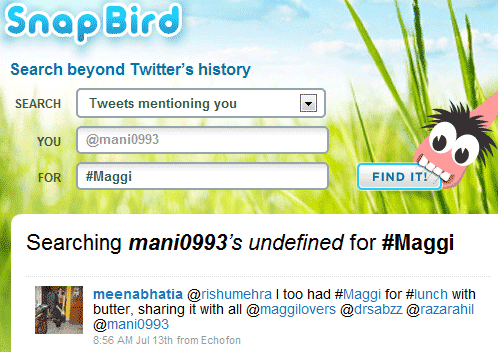 Within seconds I got the last tweet which contained #Maggi. It is quick and gives exactly what we search for. That’s the reason I like SnapBird more than any other third party app. If you are comfortable with Google Search Operators then the task of searching your own tweets will be easier than ever. Remember, SnapBird takes a little more time as compared to Google for searching your own tweets. So Google ultimately wins in terms of speed. Enter the below term in Google after replacing my twitter handle with yours and also change the keyword from #Maggi to whatever you want to search for. But if you are searching for accurate terms, then the above search operators won’t be useful. Better use SnapBird or the 3rd method i.e. TweetScan for accurate search terms. When I first read the term TweetScan, even I thought that it would be an online app like SnapBird which would directly scan my tweets and search within it. But that didn’t turn to be true. In fact it’s a tool which backups your twitter account including mentions, timeline, followers, followings, favourites and DMs. And then offers us to download the backup in the form a HTML page or an Excel sheet. (.CSV file). After downloading the backup you can easily search whatever you want using the TweetScan’s search function OR with your browser’s search bar. So if you are in a hurry and want to search within your own tweets then I would recommend you to use SnapBird or the Google Search Operator method. On the other hand, if you’ve enough time and you want to search specific and long terms then use TweetScan. If you liked this post and it helped you in searching your own tweets then Subscribe to Our RSS Feeds / Daily Updates. Also, if you like my tweets then follow me @mani0993. Do you use any other method or online app to search within your own old tweets ? Pretty nice tools! So much easier than scrolling down manually to find an older tweet, especially when I have over 1,000 Tweets! Great post, Main! These methods will make Twitter more easy to use… oh, SnapBird looks cute!